Getting more fiber is a tasty proposition if you start cooking barley once or twice each week. Barley is the highest fiber grain I know of and has been sited with a plethora of health benefits: Regularity, lower cholesterol, intestinal protection, protection from arteriosclerosis, gallstones, cancers, heart disease and heart failure, cardiovascular and breast cancer benefits for postmenopausal women, lower risk of Type 2 Diabetes, protection from childhood asthma, and the list goes on! 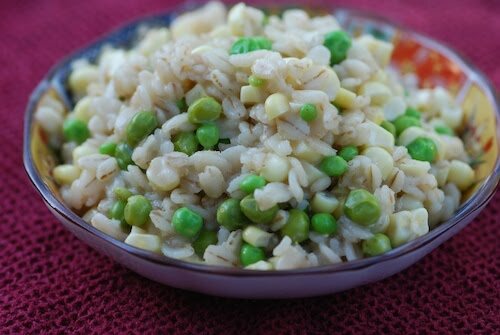 For me, the taste and texture is a good enough reason to eat barley – and its a nice change from brown rice. 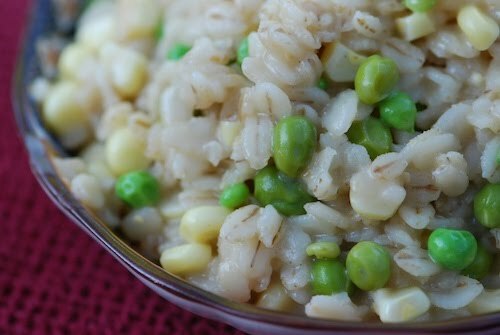 Here is a quick and easy recipe that takes advantage of spring peas and early corn – or load it up with any of your favorite veggies! Eating healthy really isn’t that hard. Choose a small but satisfying piece of high-grade meat (avoid bulk and processed meats – over 70% of the market!) and complement it with a half plate of veggies and a quarter plate of whole grain. Your body and tastebuds will thank you for it! Bring stock to a boil, add barley and half the peas, cover and reduce to a simmer. When barley is almost done (10 minutes or so) stir in remaining peas and corn and cook for 3-4 minutes longer.